Divided highway systems utilize various methods to separate oncoming traffic lanes. The main method used is the placement of concrete barrier between opposing lanes. The individual Departments of Transportation in each state have specific standards for the size of highway barrier wall to be utilized in road construction projects. 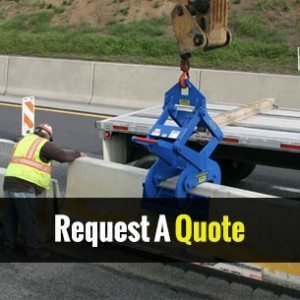 These protective concrete barrierwall systems are also widely known as jersey wall, jersey barrier, median barrier, medial barrier, or highway dividers. Below is a list of the wall sizes normally being used in each state. Wall styles also vary by state. Kenco manufactures the Barrier Lift, a device that moves concrete barrier wall safely, making the job of placing concrete wall much easier. Kenco can provide anything from a 1500 pound capacity curb lifter with a 3 – 12 inch grip range, to our 40000 pound capacity model that boasts a six to twelve inch grip range. See this and many more Kenco attachments for excavator, wheel loader, and backhoe machines at www.kenco.com .